After falling unconscious for what Data claims was thirty seconds, Picard finds all the clues that they were out for much longer without the help of Blue. We start on the holodeck where Picard has a date with Guinan to show her around the Dixon Hill program. They unwittingly get involved in a holo-murder and Guinan says "this is what you call fun??" 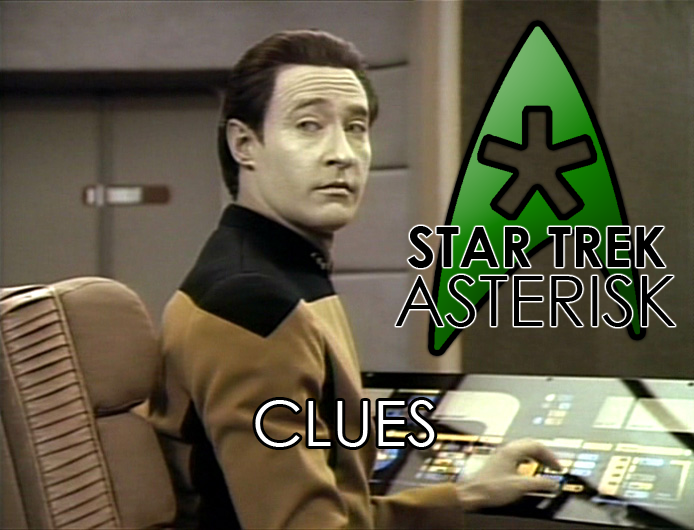 Picard insists that the hunt for clues is the fun part. Who killed him? Where's the money he was talking about? But then Data calls in with a 24th century mystery: an M-class planet in a system where it shouldn't be. 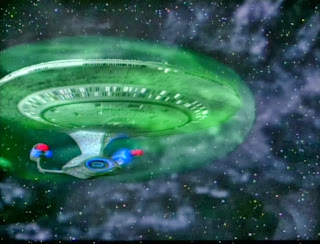 When they go to investigate, the Enterprise falls into a wormhole and everyone passes out just in time for the commercial break. When, they come to, Data claims that they'd been out for only thirty seconds. He remained awake because of his special androidness. Riker says the ship indicates an entire day's worth of travel, but they were just in a wormhole, so he's not surprised. 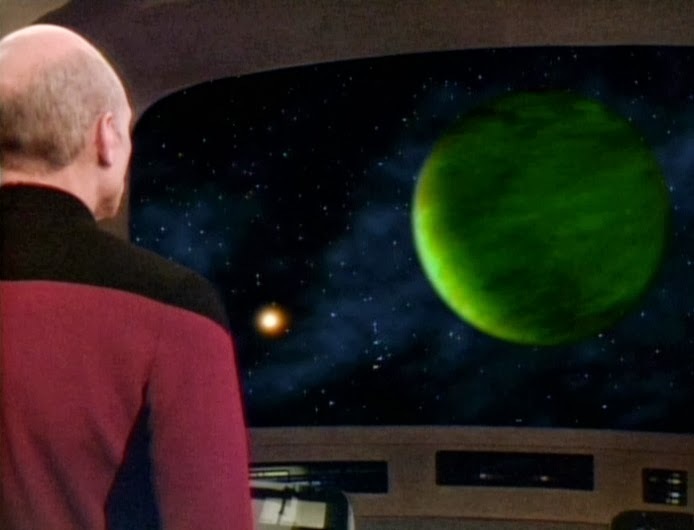 Riker and Picard wanna go back and check out the M-class planet, but Data says it would be too hazardous and to send a probe instead. Picard agrees; Data makes it so. Meanwhile, Crusher is working on O'Brien's hand in sick bay when she notices that a plant experiment she was running exhibits a full day's growth. She presents this to Picard, and then the probe comes back with completely different readings about the planet than they had before. This planet is a rogue from the Buttermilk Nebula. No, wait.. yeah, that's a sticker. Both of these discrepancies Data blames on the wormhole, and he presents a plausible, yet flimsy excuse for it, but the senior officers aren't buying it. Geordi, in particular, wonders why his beard didn't grow in the missing day. I keep reminding him that he can't grow a beard. Nevertheless, they proceed as though the ship is, in fact, missing a full day and Data is lying about that for some reason. Geordi examines Data's insides and finds that he's in perfect working order. Then Geordi checks out the probe to find that it had, in fact, been tampered with. Meanwhile, Troi starts having dizzy spells and hallucinations. When she looks in the mirror she doesn't see herself. It's her face, but it feels like an empty shell. The evidence stacks up that something crazy went on when Worf reports to sick bay with pain in his wrist. Crusher finds that it was broken and repaired with her own dermal regenerator. This suggests that they were all awake and aware for longer than thirty seconds. Picard gets down to brass tax and questions Data directly. 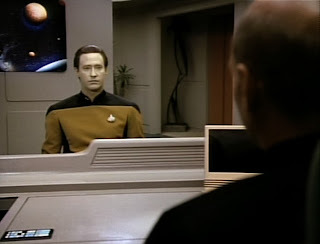 In the interrogation, Data suggests (but does not submit evidence) that he is lying in order to protect the ship. Well intended or not, it is a court-martialable offense. And Data don't give a frak. The evidence thus far suggests that they were awake for a whole day, met with opposition, and came to a stalemate; a state of play that is being dutifully maintained by Data. And it all has something to do with that M-class planet. So Picard orders the Enterprise be taken there at once. When they arrive, they meet a green glow cloud that sends a ball of energy toward them. This ball of energy disperses in the shields and then reintegrates... inside Deanna Troi. She wakes up, possessed by an alien, and confronts Data, upset that "it" didn't work. Data tells her to do nothing; that their problem may resolve itself. Then Data goes to the bridge and tells them to turn the frak around. Picard, not about to take orders from his subordinate, asks why, and Data persists in not answering his questions. It is then that Picard considers that perhaps he was ordered to stay silent. By Starfleet? Data still doesn't answer his questions, but when the glow cloud gets angry, Data admits that he is following orders: Picard's orders. He tells the story how they were knocked unconscious by the Paxins. Their idea, as a xenophobic race, was to take over the ship, send it out of their space, and leave. When they woke up, it would be no harm, no foul. But since Data didn't go down and subsequently revived the crew, it threw a monkey wrench into the works. Or it threw a Galaxy class starship in to the works. Whatever. The Paxins, inhabiting the body of Deanna Troi and fending off Worf's advances by breaking his wrist, threatened to destroy the ship because of this, but then Picard worked out a deal where the Paxis put the crew back under and use their technology to wipe their memory of anything that had happened. Then he ordered Data to keep the secret at any cost. Unfortunately, they left behind a few too many clues to what had actually happened. Picard says they have to try again, but this time, eliminate all the clues so that the Enterprise just floats along its merry way. So, that's exactly what they do. When they wake up for a third time, Data is able to convince them that it was only thirty seconds, but, in fact, it was OVER TWO AND A HALF DAYS. I love a good mystery. But a mystery is only as good as its solution. And this solution just really doesn't do it for me. The story was really good right up until we learned that Picard willingly and without hesitation ordered the erasure of the entire crew's memories. Not to mention the fact that they would definitely notice once they got to the nearest starbase that their clocks are off by two and a half days. Other than the end, however, this is a great, engaging story.